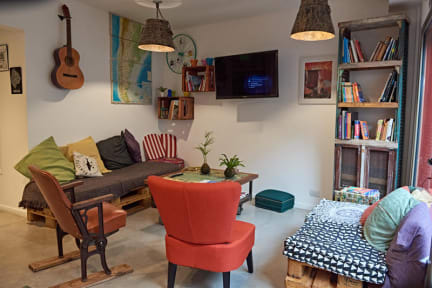 Malevo Muraña is an outstanding hostel located on the hip area of Palermo, a traditional neighbourhood of the city. Our name and decoration are inspired by the story of 'Juan Muraña” that took place on the same house were the hostel is located, written by worldwide famous argentinian author Jorge Luis Borges. Eclectic and modern style is mixed with decoration related to Tango, the city of Buenos Aires and argentinian culture. Just a few meters walk from the hostel you will find plenty of bars, cafes, restaurants with the best gourmet food of the city and designer shops. Stay with us and experience life like a porteño (a Buenos Aires citizen), meet people from all over the world and feel at home! Our receptionist will help you with any request and give you the best tips to know our city, best places to eat, shop and party. Share your best moments in Buenos Aires with us! 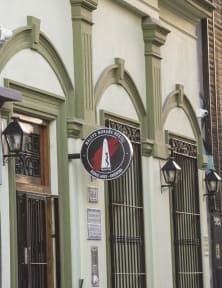 We are located in the center of Palermo Soho, design and urban vanguard neighborhood just 4 blocks away from Santa Fe Avenue, where you have easy access to more than 20 bus lines and subway station Plaza Italia (D Line) that connect you with the main touristic areas of the city. Our hostel is located in a brand new building. Everything in the hostel is brand new and carefully chosen for you to have the best experience: individual light, plugs and usb for each bed, lockers, safety box and luggage deposits available at reception, tourist advice, entertainment and more! terrace with barbecue, ideal place to share the traditional ‘asado’. We have another terrace where you can enjoy the sun and a backyard to enjoy live music sessions and chill. The hostel has a bar of its own, were you can enjoy game nights, music and meet friends from all over the world. Taxes included in final price. Foreigners paying with foreign credit/debit cards don’t pay 21% tax (thus resulting in a 21% discount from the final price). Apenas uma noite, mas a locação é maravilhosa e staff foi muito simpático. O banheiro do quarto estava um pouco sujo, mais em função dos hóspedes que do hostel.